Southern Maryland’s Budds Creek MX Park hosted the fifth round of the Lucas Oil Pro Motocross Championship, sanctioned by AMA Pro Racing, on Saturday, as each of the series’ points leaders added to his respective championship advantage. 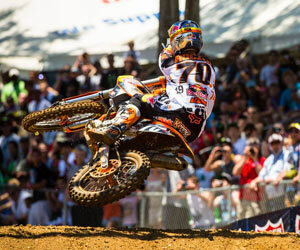 Red Bull KTM’s Ryan Dungey raced to his third consecutive 450 Class win with a third straight 1-1 moto sweep. In the 250 Class, Monster Energy/Pro Circuit/Kawasaki’s Blake Baggett secured his second victory of the season thanks to a triumphant effort in the second moto. In the opening 450 Class moto, Team Honda Muscle Milk’s Justin Brayton grabbed the holeshot, but Dungey wasted little time in making his move to the front. Once in the lead, Dungey extended his advantage over the field every lap, eventually winning by over 40 seconds. In Moto 2, MotoConcepts Suzuki’s Mike Alessi assumed the early lead and stayed out front for three laps before Dungey moved past. The KTM rider then pulled away from the field consistently en route to the checkered flag. Monster Energy/Pro Circuit/Kawasaki’s Broc Tickle captured the best finish if his career in second (2-2), while Alessi rounded out the podium in third (4-3). Dungey extended his lead in the 450 Class standings to 54 points over Alessi. In the 250 Class, Baggett started the day off with a strong runner-up effort in the opening moto, following GEICO Honda’s Justin Barcia across the line. 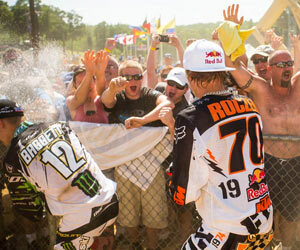 However, after Barcia started Moto 2 outside the top five, it allowed Baggett to put himself in position for the win. Red Bull KTM’s Ken Roczen looked poised to challenge for his first career victory on U.S. soil by leading the majority of each moto. 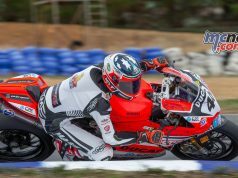 However, the former FIM World Motocross MX2 Champion was passed late in the first moto by both Barcia and Baggett, and ultimately gave way to Baggett in Moto 2 as well. By virtue of his second moto win, Baggett solidified the overall victory with 2-1 moto results. Roczen extended his podium streak to five rounds with a career best second-place finish (3-2), while Barcia fought his way to a solid result in the second moto to finish third overall (1-5). Baggett extended his lead in the championship to 13 points over Barcia. Following a two-week break from competition, the 2012 Lucas Oil Pro Motocross Championship continues on July 7, with round six from RedBud in Buchanan, Mich., and the Red Bull RedBud National. Red Bull/KTM Factory riders Ryan Dungey and Ken Roczen delivered another successful result at the Budds Creek MX Nationals on Saturday with Dungey extending his winning streak to three in a row and the German teenager scoring his career best at second in the 250 class. Dungey’s 1-1 result also surged him even higher in the overall points and he now has a 54-point lead in the competition. Roczen, who is currently fourth in the 250 class overall standings shares equal points with third placed Eli Tomac and is only nine points shy of second. Dungey sent an early signal to the opposition when he laid down a qualifying time in the morning practice sessions that was two second faster than his closest opponent. Dungey carried that momentum into the first moto where he got off to a great start, took an early lead and then led every lap to win by 43 seconds. “I felt very comfortable on this track and was able to pull away early and just focus on my own race,” commented Dungey after the first moto. In the second moto, Dungey was out of the gate in second behind Mike Alessi but slipped past his rival after the first few laps. Once out front, he was easily able to secure the second moto win. 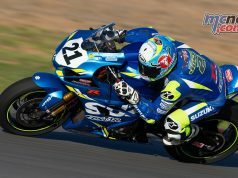 His 1-1 moto finishes earned him his third consecutive 450 Motocross class win for the season and a further firm grip on the coveted red plate. It was also a great day out for KTM’s two European riders contesting the 250 class with Roczen scoring second for his career best in this competition in just the sixth round. French teammate Marvin Musquin finished fifth overall. Roczen grabbed the holeshot in his race one and pulled out an early lead in the opening laps. 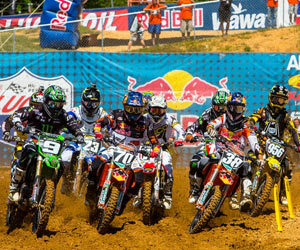 He held on to the lead through the first half of the race before Justin Barcia slipped past him. Roczen lost one more position on the next lap, which dropped him to third. Musquin was fifth out of the gate and finished fourth in one of his best rides yet this season. In the second moto, Roczen leaped out front to pull the holeshot with Musquin in second right on his tailpipe. 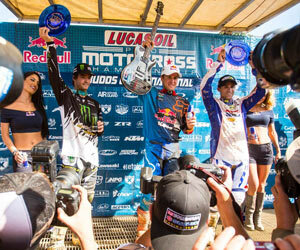 He then pulled a large lead early in the race while Musquin battled inside the top three. 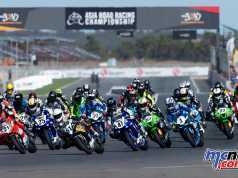 The German teenager had more than eight seconds lead on the rest of the pack before being held up by lappers, which allowed Blake Baggett to catch up. Baggett eventually made the pass and Roczen dropped to second but his 3-2 earned him his career best second overall. Musquin picked up a fourth in the second moto for fifth overall.